So here I am with another FOF. This time it’s nothing special but I’m so proud of my newest accomplishment. Pockets, yes, I did include them in this pattern. So without much ado here’s my newest addition to my working wardrobe. 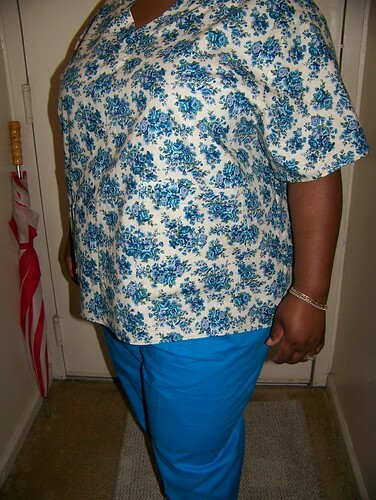 Kwik Sew 3201 using view A pants and view B scrub top. I had cotton in purple solid and print fabrics. I love that this only cost me $12.00 to make instead of what I have been paying. I feel like I have such a wickedly great secret. Needless to say, I did notice or as some of us would say I had an ah moment while putting the pants together. I will be taking this knowledge and making me some shorts and capris. This will be a quick and easy way to increase the summer wardrobe. Well, I have to get back to my homework as I have finals next week and need to be on top of my game. I have some other things to share with so I hope to get back here over the weekend. Thanks so much to all of you who have come to include me as a regular read and those that are still trying to see where I’m going. See ya soon. Here’s some photos to show what I’ve been up to. After these pics I’ll tell you about my frustrations. First up is my youngest girl Ms. Camille in her tropical dress. I did this quickly with the material already cinched at the top and then I added a ruffled edge and straps for modesty sake. 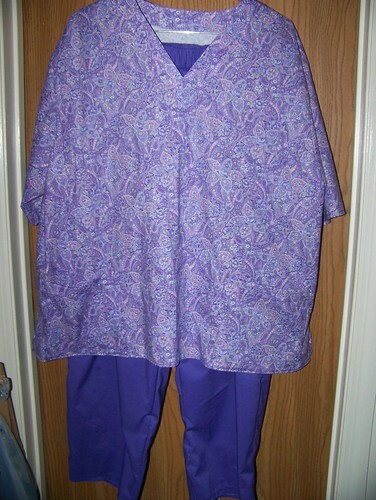 Next we have my first attempt at scrubs for school and Externship made from Kwik Sew Pattern 3201 I have had the top material for at least 4 years or more and then a quick trip to JoAnn’s up the street to match the pants and this is what I came up with. I did experience some rough spots in the process of making the top. 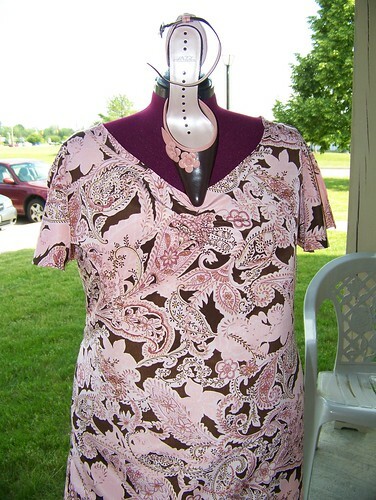 It was the joining together of the front neckband to the V of the top. After a few tries of positioning and then repositioning I got it. 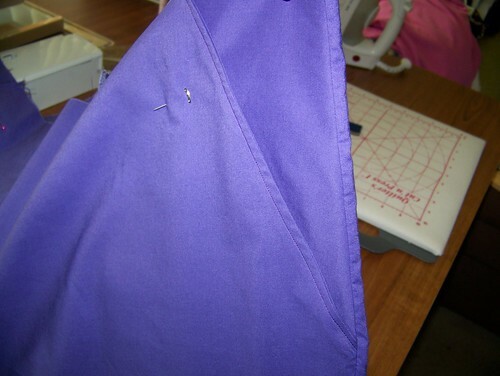 Overall, I’m very pleased and already have the second set of scrubs cut out waiting to be pieced together. I showed you a bolt of fabric that I had been trying to figure out a dress pattern to use to match with a pair of shoes I purchased a few years ago and never could find the right outfit. I ended up using Simplicity 4877 view C for this dress. This dress did cause me some pain. First in the fact that I had to shorten the waist and then still had to add darts to rid the back of the puckering I get in RTW clothing do to my short but full stature. I meant to have my picture taken wearing this at the wedding I attended but to no avail. I will take one with me in it. BTW, my dress is being modeled by my new dressform Betty B. and I absolutely love her. It made the process so much nicer and now I can really figure my form out and make good use of my planning time before I sit down to sew. Now on to frustrations……my only one is after sharing all of this I don’t have the time to devote to all the UFO’s that I have. There’s an art to staying on task but this quarter I just can’t seem to find the time. I have four classes and the work load is so overwhelming. We’re in the last 2 weeks of the quarter and I feel as though the floor is giving way and I’m falling through. Don’t get me wrong, there’s really a true level of excitement going on for me right now as this is my last quarter before going on my Extern-ship in July. I don’t know how soon I’ll be back with you to share what I’ve been up to so here’s just a brief peak into what I have planned NewLook 6700 and 6674 both are summer dresses. Well, until next time happy crafting.